Following a poor Republican result in the US mid-term elections, US President George W Bush has announced that Defence Secretary Donald Rumsfeld is to step down. 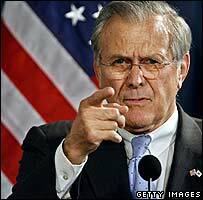 Mr Rumsfeld, one of the longest-serving defence secretaries, is known for his rhetoric. Here are a selection of quotes from his six years under George W Bush. As you know, you go to war with the army you have, not the army you might want or wish to have at a later time. It seems to me that it's up to all of us to try to tell the truth, to say what we know, to say what we don't know, and recognise that we're dealing with people that are perfectly willing to, to lie to the world to attempt to further their case and to the extent people lie of, ultimately they are caught lying and they lose their credibility and one would think it wouldn't take very long for that to happen dealing with people like this. We know where they [Iraq's WMD] are. They're in the area around Tikrit and Baghdad and east, west, south, and north somewhat. And it is not knowable if force will be used [in Iraq], but if it is to be used, it is not knowable how long that conflict would last. It could last, you know, six days, six weeks. I doubt six months. [Osama Bin Laden is] either alive and well or alive and not too well or not alive. No terrorist state poses a greater or more immediate threat to the security of our people and the stability of the world than the regime of Saddam Hussein in Iraq. Reports that say that something hasn't happened are always interesting to me, because as we know, there are known knowns; there are things we know we know. We also know there are known unknowns; that is to say we know there are some things we do not know. But there are also unknown unknowns - the ones we don't know we don't know. Once in a while, I'm standing here, doing something. And I think: 'What in the world am I doing here?' It's a big surprise.